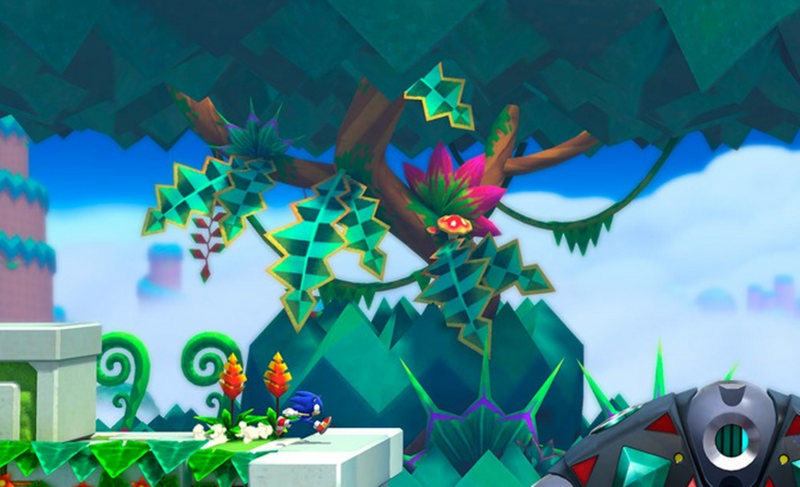 The official website for Sonic Lost World has expanded to reveal the names of the seven worlds featured in the game as well as the eight color powers players will be able to utilize. Interesting to note, the game looks to be going with the Mario naming convention of “Worlds” for the stages that have typically been labeled as “Zones” or “Action Stages” in past titles. Meanwhile, “Zone” replaces “Act”. We haven’t heard an official reason for this from SEGA, but my guess is that each “World” features very unique “Zones”. Frozen Factory, for example, has a snow stage and a casino stage. Both are very different, so they’re not so much different acts of the same Zone but are rather their own Zones in and of themselves. Confusing, but it makes sense if you think about it. After the break, SPOILER ALERT, it’s the World names and Color Powers. Where Sonic begins his adventure! Windy Hill offers giant windmills to climb, huge islands to bounce between and deep, dark caverns to explore. Desert Ruins doesn’t just offer huge desert plains to discover and huge sandstorms to escape from… Sonic must also explore the sweet-filled ‘Dessert’ Ruins and a giant bee hive! The beaches of Tropical Coast are not as they seem. Packed full of seaside badniks out to take down Sonic, he must use all his might to blast across islands and even go underwater! Skate along the icy paths of Frozen Factory at lightning speed as the mechanical arctic islands turn into a casino filled extravaganza. Deep inside the darkest of woods, Silent Forest offers maze-like caverns, tumbling temples and crocodile-filled swamps to try and stop Sonic in his path. Speed along and sky dive miles above the clouds in Sky Road as you take on colossal enemies before reaching the decisive battle with the Deadly Six’s leader Zavok! Things heat up in Lava Mountain as Sonic must avoid deadly fire pits, navigate the inside of volcanos and escape the path of massive cannons. Unleash the cosmos and use the devastating Asteroid to tear up levels and destroy enemies by tilting the GamePad. Master the beat by tapping the Wii U GamePad screen to groove your way through levels using the Rhythm Colour Power. Use the Eagle to take to the skies and soar through the air as you tilt the GamePad. Roll the bomb using the GamePad gyro to crush your enemies and explode into them with an inferno of destruction. Zip along levels and shoot through your enemies with a swipe of the GamePad using the powerful Laser. Use the GamePad touch screen to tear up the ground with the Drill or even surf underwater! Aim with the GamePad and blast into the skies with the Rocket to navigate around the islands of the Lost Hex. Avoid deadly pits with the Hover and use the Ring Dash to cross huge canyons. Sonic can now electrocute enemies with lightning, tear up levels as an asteroid & cause ground shaking earthquakes. He’s more powerful than ever! Grey Quake. Red Burst. Ivory Lightning. Eh, they’ll always be called zones and acts to me, even if that’s not what the game calls them. Grassy, Tropical, Snow, Forest, Sky. It seems for most of the game the level themes seem to be kinda pleasent. there is footage on the official US website.